This is not an article about email marketing. Most people sort their inbox on top to bottom. Whenever they have time, they go to the top of the inbox and start handling mails downwards. After few mails are handled, there is bound to be some interruption – phone call, drop in, meeting, lunch, etc. Once you are back after the interruption more mails have accumulated at the top of inbox. However illogical it may seem, people just go to the top again and start handling mails. In short, if your mail needs to be noticed, it must be lucky enough to catch someone’s attention at the moment they are handling mails at the top. Now, we must find a mechanism by which you can send mail to someone at the right time. How do you find the right time? It may sound like an impossible task… but there are ways. Very often we use mails so that we have a “mail trail”. This makes us feel safer in case there is some dispute later. Mail trail is a valid legal evidence in most cases. Now, instant messaging applications also store an audit trail of all official chats on the server – just like mails are archived. So even a chat using corporate instant messaging tools like Lync is legally permissible evidence. Therefore, if it a quick thing you want to ask someone – DO NOT send mail. 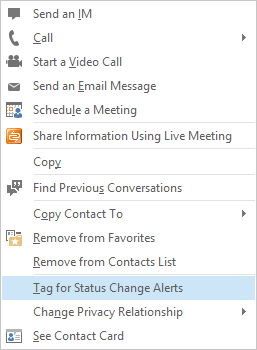 Check on Lync, if person is free – start chat and finish it off. If person is busy, use the Tag option described above. Of course you can also do a combination. Send mail and also tag for status change. If you an solve it on chat, just recall the mail! I know this is approach does not sound right… but let us explore it anyway. Sending the same mail twice with some interval in between doubles the chances of getting the response. Of course, it also increases the mail storage and bandwidth usage from a technical point of view. But we are just trying to get attention. Just for the moment, if you want someone’s attention and you sent two mails with a one hour gap, what will happen? It is very unlikely that the person will notice that you sent two copies. If she does notice it and question you about it, you can say it was a mistake. If she responds to the mail, obviously it will be one of the two copies. In which case the other copy is not read yet. You can simply recall the message. The recall should succeed. NO, you cannot change the formatting of the subject line and make it big and bold. But the sentence you put there can make all the difference. The simplest thing you can do is to THINK first. Often it is a mail trail – so the original subject is still hanging around. It is a good idea to CHANGE the subject and make it more relevant. For example, compare these two subject lines… which one has a higher chance? Subject: New Design for Invitation – needs urgent approval from you. If you don’t get response to your initial mail, you can RESEND it. This simple action increases the chances of the mail being noticed – as explained in item no 3 above. But while resending it – Add the prefix RESENDING: to the subject. This word may influence someone to look at it more seriously rather than skipping it. The fact that this mail was resent increases the sense of responsibility and accountability in the mind of the recipient and influences her to click on it. It is all about psychology – not technology! This is an ingenious but wicked way. Mark the mail, while sending it with a follow up flag which was due Yesterday. 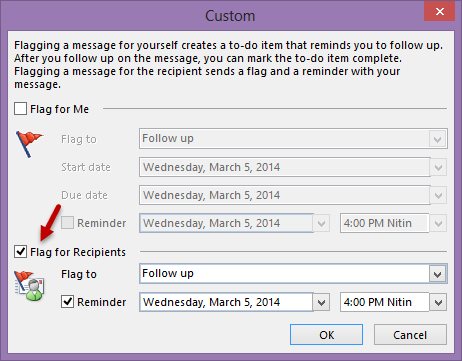 Remember to change the Recipient follow up flag. Not your flag. Then the mail stands out in the recipients mailbox – it becomes red in color. Part2: How to make sure the mail is read fully? It should fit in the visible area of Reading Pane. If it requires scrolling, you have already lost the battle – unless the visible part is compelling enough to compel the reader to find out what is below. It does not cost anything, but the content stands out. Especially if you have written lots of boring text in large amounts. Usually, when we write mails, we are just typing what comes to our mind – in the order in which it comes to our mind. That is not necessarily appealing to the reader. That is why you must “reformat our thoughts” from the other person’s point of view. This concept applies not just to mails but all types of communication. Unfortunately, we think of mails as an informal form of communication. Therefore, mails do not receive enough attention which formal documents receive in terms of readability, aesthetics and layout perspective. This is easy to do. Bullets and numbering force you to be concise and structured. Bullets are used for assorted collection of things whereas Numbering is used to show a sequence or identify each item clearly so that it can be contextually discussed. In many cases you can actually write junk in the non-bold part and nobody would notice! Remember, like you, everyone is tired of seeing text and text and more text. Any deviation from that monotony is welcomed by the tired and inundated brain. Tables make it easier to show more data in lesser amount of space. Tables are also easier to read. Using visually appealing colors with light/dark banding just requires few clicks in Word (and Outlook). Get discounted rates I tried talking to them. They want to talk only with you. Have some separation between sentences. Crowded things put off people. Increase the paragraph spacing and line spacing. Increase the size of the rows in tables and center vertically. Increase the cell margins. Anything which gives a sense of separation is good. WRITE SHORT SENTENCES. Break them often. Mails are read on various devices. Sometimes on large, bright monitors and sometimes on small, dim mobile phone screens. The text you write wraps around. What looks like a paragraph filing the entire screen on a mobile will look like a very long, single line on a big monitor. Both are counterproductive. Because device based rendering is unpredictable and beyond your control, you must control what you write. I have two ideas to discuss with you. One is about the new policy we are discussing and the other is about providing latest hardware to my team. I want the new policy to be finalized quickly because we need it in place before the new year begins. Otherwise we will have double workload. In fact, we need hardware also urgently because the processing of year end reports is going to be very slow otherwise. Else it will lead to duplication of work. Data size has doubled last year. Using existing hardware will delay the financial closure. Mail and time management articles Actually it should be called what previous? 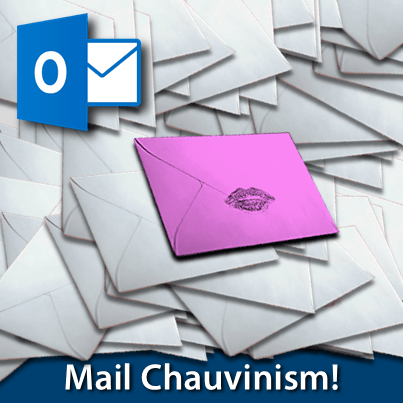 I hope you have seen a series of articles I wrote about Outlook and mail management. If not, have a look and share it with your colleagues. Try these ideas and let me know your feedback. I am sure you also use some innovative ideas make your mails stand out. I would be extremely interested in knowing your methods. I am sure other readers can also benefit from each others contribution.